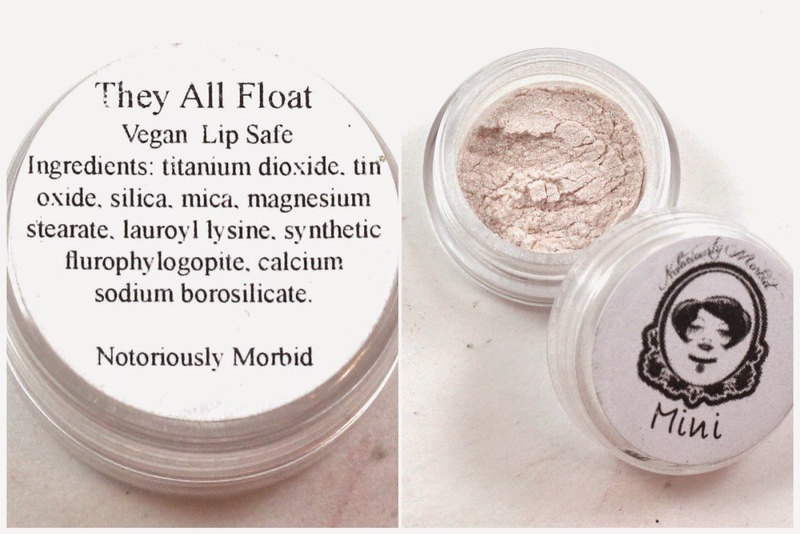 Notoriously Morbid is another indie cosmetics company that offers a monthly subscription that includes exclusive products not available in any other way. 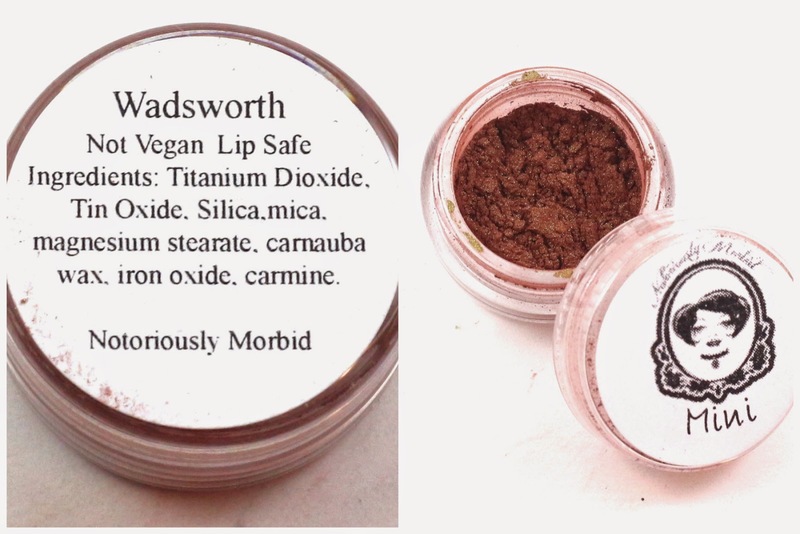 It's called the Vanishing Cabinet, and it typically includes 4 mini jars of exclusive shadows, and then extras from Notoriously Morbid, and sometimes other companies. They also have a theme each month, and this month was "Dark Cheshire" inspired by Tim Curry and his films. The monthly Vanishing Cabinet is a recurring $12.90 subscription, and everything comes packaged in a paper envelope with a little note explaining about this month's theme. Mine shipped via USPS and arrived in 2 days from West Virginia to California. So many goodies! I couldn't wait to try everything. I should mention that before each month's Vanishing Cabinet goes up for sale, they reveal the theme and colors that will be included. It doesn't tell you what the bonus extras will be, so those are still a surprise. Also, there is nothing included explaining what the colors are, so you just have to sort of guess what the description is of each color. I also noticed some of my mini jars were fuller than others. I'll be honest, I'm not a Tim Curry fan, so I don't get the references made with the shadow names. This is a pink with a soft lavender sheen and what looks like silver glitter. 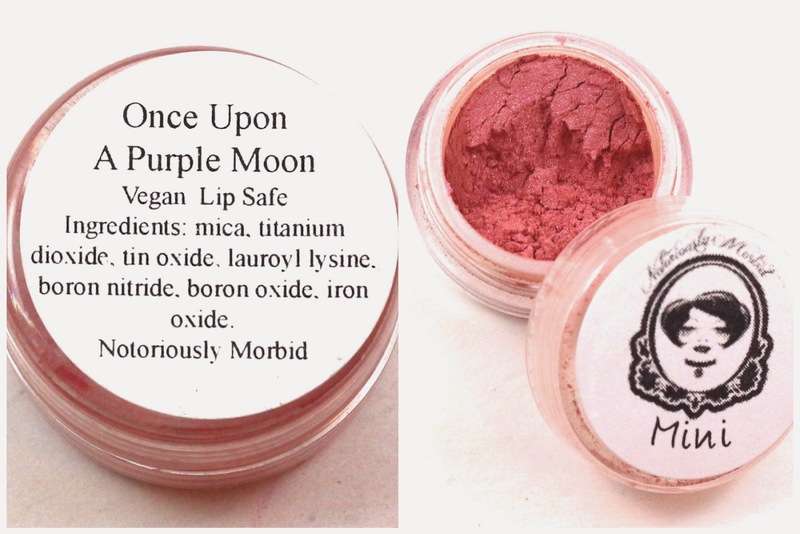 I always love me some pink eyeshadows, but I probably have a few other shades that look very similar to this. 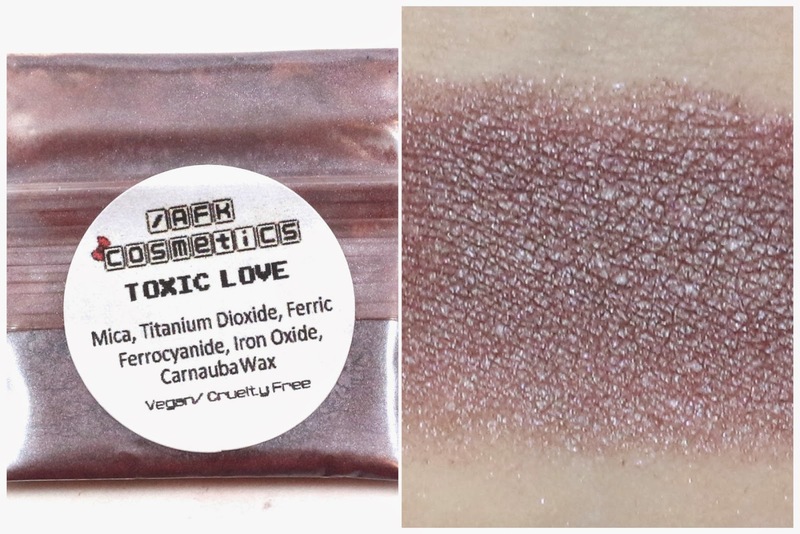 This is a dark matte brown with some pink/red highlights in it, and I'm glad to have this shade I don't have many dark brown shades and they are very versatile. This is a white shadow with larger silver glitter in it. I always like getting these kinds of shades because they are good as brow highlight colors, but I think most of the ones I have contain large glitter. It makes it so they tend to fallout all over the place, so I wish this didn't have the glitter in it, but I'm sure I will find a use for it. This is a reddish brown with green glitter, and I like this shade, I don't think I have anything else like it. This was the jar that was the least full, so much so that I could easily tell it had much less in it than the other jars. It could be due to any number of things, but it was just something to note. Swatches done over Too Faced Shadow Insurance primer: Left to right, Once Upon A Purple Moon, Solace of Shadows, They All Float, and Wadsworth. 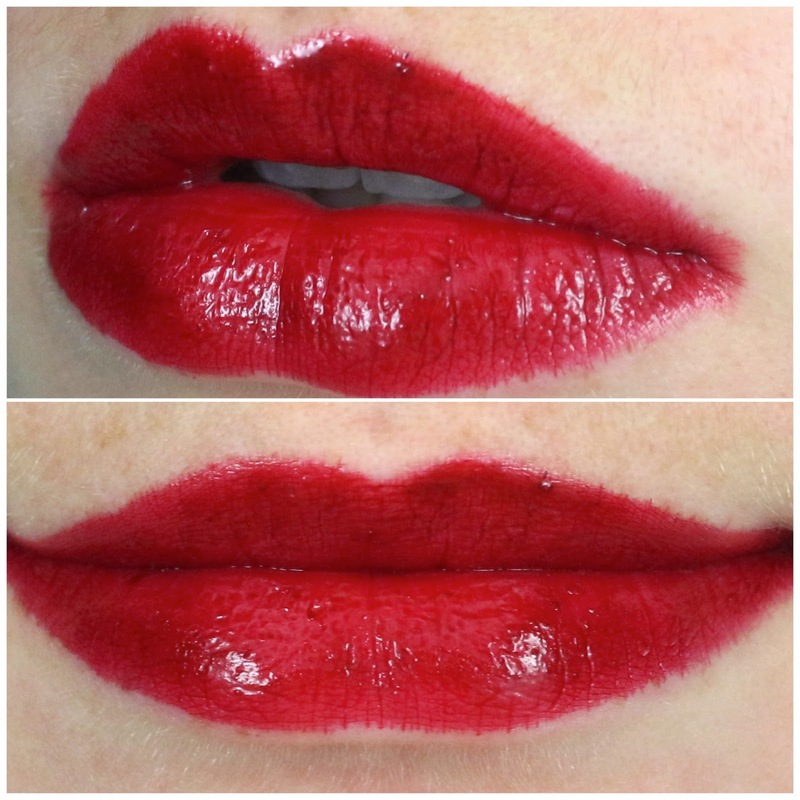 This lipgloss is dark red and very pigmented. It dries down to be semi matte almost, it's not super shiny, but will still come off on a drinking glass. It did bleed a little on me, you can see the feathering in the swatch, but it could be fixed with some liner. 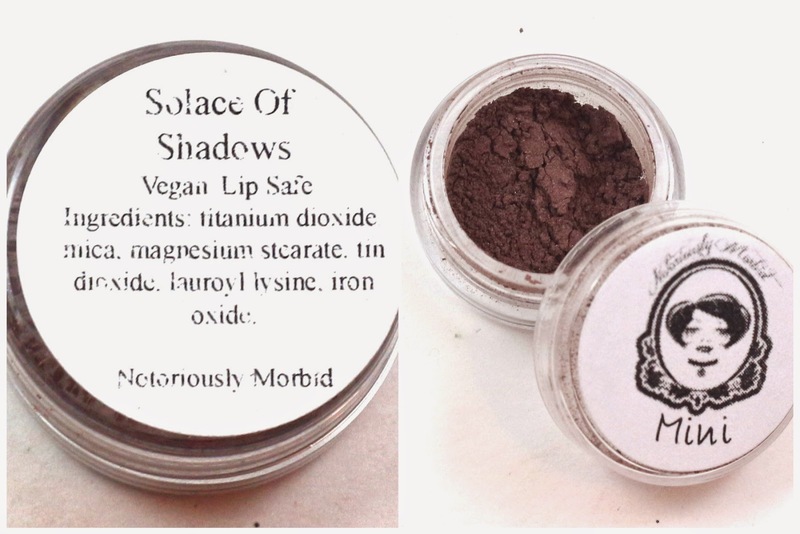 Overall, I like the formula, and if they come out with other similarly dark shades I will be all over them! From what I hear, Notoriously Morbid includes a little sample preview of the next month's theme and this one is the sneak peek. It's suspected to be a Walking Dead theme, so I'm excited for that! It's a medium warm toned brown with green and gold glitter. I just hope there aren't a ton of brown shades next month though, as there were 3 this month. I haven't been keeping up on Walking Dead once one of the episodes was accidentally deleted from the DVR, but hopefully I can catch up soon! 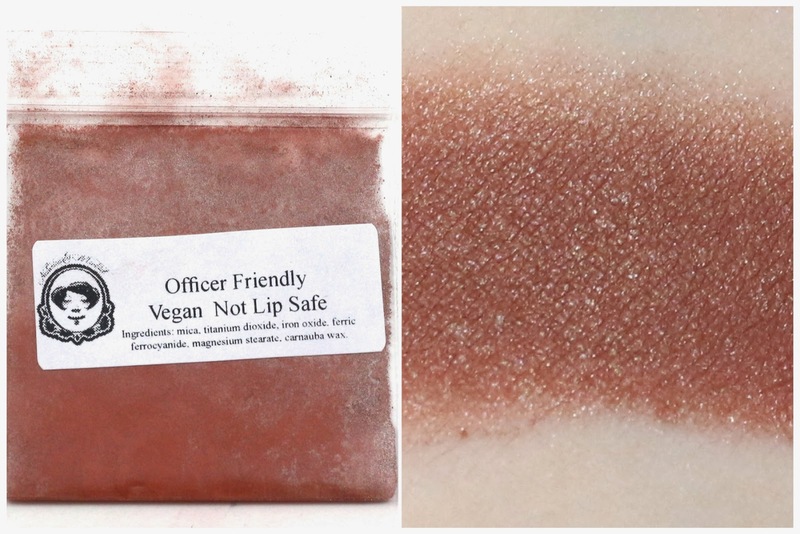 This shade is not available for purchase on AFK Cosmetics' shop, so I assume it's coming soon, or is a limited edition only in this subscription. It's a lavender/pink shade with what looks like a green/silver sheen? I am terrible at describing colors without being given a description! Anyways, I was very pleasantly surprised by this color, very pigmented, very pretty, and I love purple shadows as well. Overall, this month's Notoriously Morbid Vanishing Cabinet had a total value of $18.25, and since I only paid $12.90 for it, I think it had a great value this month! 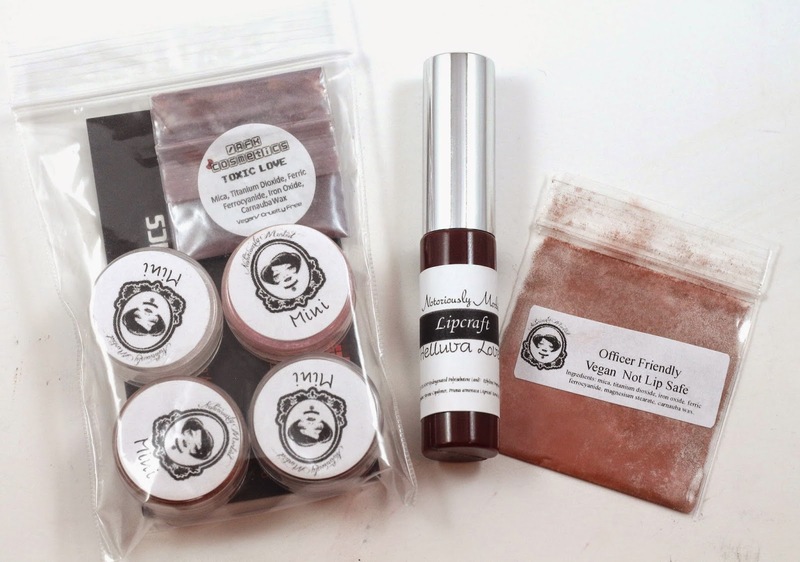 And I like that you get a sneak peek of the next month's subscription, and I love the Lipcraft, but I wish there was a little more variety this month. With 2 brown shades, a pink and a white shade, it wasn't a very unique month in my opinion. And I know there were a lot of people really excited for the theme this month, but the references went over my head! But I'm excited for next month, I think a Walking Dead theme will be great. If you'd like to subscribe to Notoriously Morbid's Vanishing Cabinet, they go up for sale near the beginning of the month, just follow their Facebook page for more information, and when subscriptions go live. It's $12.90/month, and it's a recurring subscription.